If equity can be described as the group of rights and procedures to provide fairness to transactions, often outside the realm of common law, than perhaps information equity can be described as the procedures and processes which encapsulate the fairness in information access. Information inequality exists where cultural norms and technological infrastructure inhibit the access of information by those who desire it. Anyone who feels that cultural norms have nothing to do with the equation should investigate the cultural ramifications of the American Constitution, a document which specifically gives credence to copyright and ownership (at least profitability) of new ideas, procedures, and proprietary information. It is encoded in our legalistic brains, the expectation of profitability. Information inequality is also influenced by technological infrastructure, most evident in impoverished areas, but also hindered by cultural factors (see the reluctance of the French population to give up the Minitel, perhaps due to pride of authorship?). A need for information equity is apparent when cultural restrictions do not exist, but the lack of availability does. Processes for protection are needed in these areas. 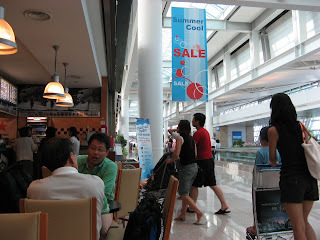 The picture is of Incheon International Airport, in Korea, which doesn’t suffer from information inequity.